We know little about the Olympic victor Polydamas (also spelled "Pulydamas") of Skotoussa, a city in Thessaly. His background, family life, and even the details of his Olympic triumph are mysteries. Aside from the fact that Polydamas' statue was remarkably tall, we have no information on his appearance. 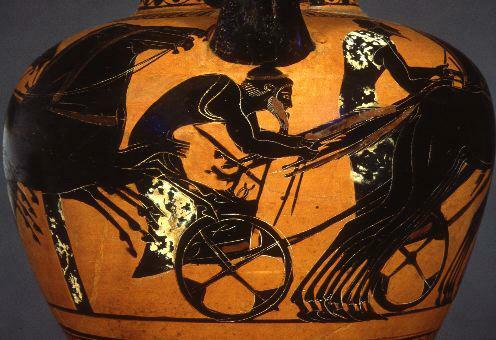 Like many modern athletes, Polydamas the pankratiast was as well-known for non-athletic exploits as he was for his prowess in the Olympic games. He was not quite as notorious as baseball's Albert Belle, though. Ancient authors tend to compare his feats to those of the legendary Greek hero Herakles. Polydamas once killed a lion with his bare hands on Mount Olympus in a quest to imitate the labors of Herakles, who slew the Nemean lion. Side A: Herakles fighting the Nemean lion. Pausanias adds that: Polydamas ...went among a herd of cattle and seized the biggest and fiercest bull by one of its hind feet, holding fast the hoof in spite of the bull's leaps and struggles, until at last it put forth all its strength and escaped, leaving the hoof in the grasp of Polydamas. 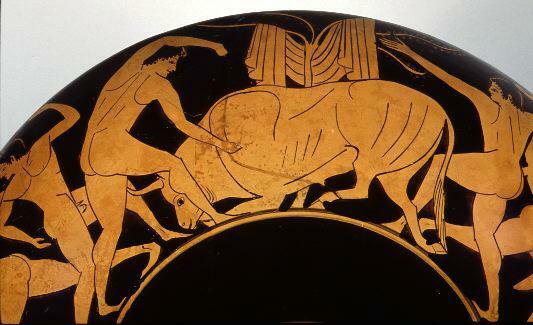 Side B: Herakles wrestles Cretan bull. Photograph by Maria Daniels, courtesy of The Tampa Museum of Art. In a similar way, Polydamas once stopped a fast-moving chariot and kept it from going forward. Side A: Charioteeer in rear. Photograph by Maria Daniels, courtesy of Harvard University Art Museums. Such exploits reached the ears of the Persians, and the king Dareius sent for Polydamas. There the athlete challenged three Persians, nicknamed the "Immortals" to fight him, three against one, and Polydamas was victorious. In the end, however, Polydamas' strength could not prevent his demise. One summer, Polydamas and his friends were relaxing in a cave when the roof began to crumble down upon them. Believing his immense strength could prevent the cave-in, Polydamas held his hands up to the roof, trying to support it as the rocks crashed down around him. His friends fled the cave and reached safety, but the pankratiast died there. Take me to the next story!